There's a quaint little house on my way to work each morning. I always look forward to walking past. I have only ever seen the occupant once. I caught a glimpse of him one day, and if I didn't know any better, I'd swear it was Jackie Chan. He was silently surveying some near by workers chop down a tree, when our eyes met. He was dressed in what I would describe as a Buddhist or monk like outfit. I said good morning and he courteously bowed his head and smiled, that was it. At the front of his quaint little house there are a number of quotes, pictures and banners. But it is a particular white board, next to his window, that I look forward too as I walk by each day. Every week he writes a new quote or statement. Last week (Monday, 30th June) as I walked past, his statement really caught my attention, it read "CONGRATULATIONS! 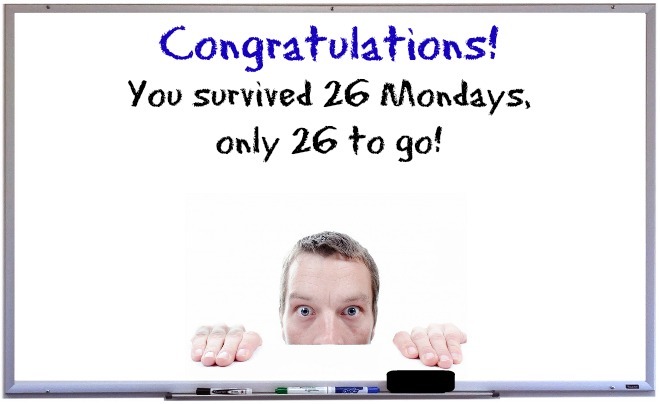 You survived 26 Mondays, only 26 to go"
His quotes are usually inspiring, simple and thought provoking. This one got me thinking. I also thought "I wonder how many other people look forward to or notice what he writes?" HOW DO YOU FEEL ABOUT MONDAY'S?" MONDAY MORNING! For many this is a dreaded thought. Re-set the alarm, back to the grindstone, back to work. Where complaints run rampant, aches and pains are common and cheerfulness is restrained till thirsty Thursday and fabulous Friday. It seems many people start unconsciously and negatively preparing for the working week ahead by Sunday evening. On Sunday nights the sky is filled with Monday morning dementors, sucking up any excitement and joy. The song "hi ho hi ho, it's off to work I owe" sung silently and not so merry. I overheard a smartly dressed, articulate women on the train the very day I read Jackie Chans Monday quote. She was chatting away with her regular train buddy. In their conversation this particular day she replied "oh I hate people who are happy on Mondays" as he was cheerfully talking about his upcoming day. There is no discrimination in happiness? Rich or poor, black or white, sales clerk or CEO. Happiness lies dormant in each of us, those that bring it to life - chose too! No one has invented a way to skip straight from Sunday night to Tuesday morning, so we must face it. We could ring in sick each Monday. But that's not such a great thought as Tuesday then becomes Monday and it all gets very confusing! You can't escape it! When you find a way to LOVE WHAT YOU DO or DO WHAT YOU LOVE, Monday is just another great day filled with opportunity, possibility and adventure. Whatever work you do - find something you can love about it, challenge yourself (no matter what anyone else in the company does or doesn't do) improve YOUR knowledge, attitude, sales, pb (personal best). Do your role and do it the best you can. If your not doing what you love and just can't love what you do - do it anyway - with effort - with gratitude - and start looking now for something you love to do. Opportunities are everywhere - we just don't often see them. At the same time we often have to create them. As for my (look alike) Jackie Chan, I don't know if I'll ever get a chance to talk to him, I hope so. I'd like to know what he does for a living. But for now I will continue to look forward to his short little quotes and captions and remember that Monday is just another day that can be filled with excitement, fulfilment and happiness! Not survival. WE choose! 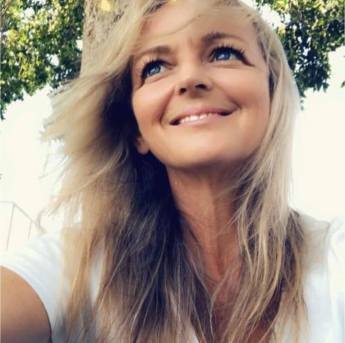 Karen Offord › Blog › Noooo, not Sunday night again!